GenerateExec is a unary physical operator (i.e. with one child physical operator) that is created exclusively when BasicOperators execution planning strategy is requested to resolve a Generate logical operator. 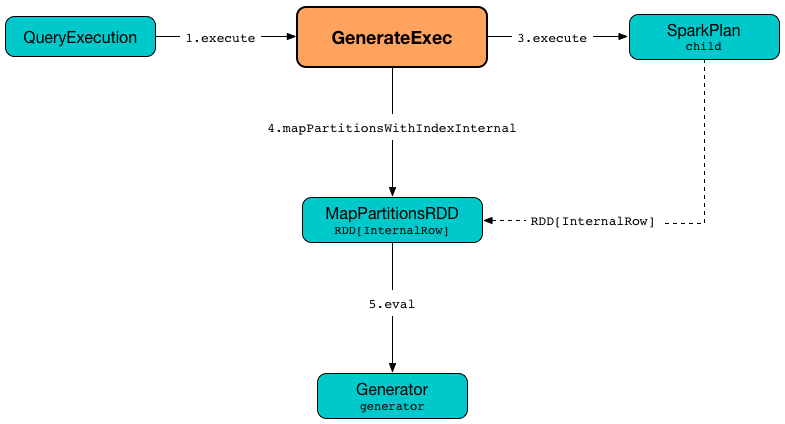 When executed, GenerateExec executes (aka evaluates) the Generator expression on every row in a RDD partition. child physical operator has to support CodegenSupport. GenerateExec supports Java code generation (aka codegen). GenerateExec does not support Java code generation (aka whole-stage codegen), i.e. supportCodegen flag is turned off. GenerateExec gives child&apos;s input RDDs (when WholeStageCodegenExec is executed). 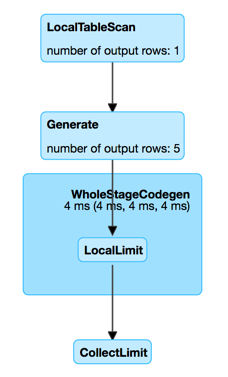 codeGenCollection is used exclusively when GenerateExec is requested to generate the Java code for the "consume" path in whole-stage code generation (when Generator is a CollectionGenerator). codeGenTraversableOnce is used exclusively when GenerateExec is requested to generate the Java code for the consume path in whole-stage code generation (when Generator is not a CollectionGenerator).